So, what often describes the artist? What is often said about the artist but not the artisan? Is it that the former is temperamental? What is often said about the extraordinary artist? Is it that genius and insanity are closely related? Here I am commenting on my own post again, which is … such a sad thing. In defense, I refer to one of history’s more inglorious persons. A man by the name of Pontius Pilate wrote some small note, to be affixed to a cross. Later, in defense of his actions, he was reputed to have uttered the Latin words “Quod scripi scripi” The idea behind my use of the phrase, one that translates into “what I have written, I have written”, is that I wrote what I wrote for a reason that seemed to be a good one at the time I wrote it. It’s sometimes a matter of the context in which it was written, as well as emotional feelings that, at the time, we attached to the writing. So, now I add clarification to the original message. I think that it’s not clearly stated, in the title article, that there is a difference between the creative and the emotional. However; the emotion brings about a creativity of its own type – by the appreciation of the vividness and meaning of feeling that is attached to a subject. It is possible to possess a stark, logical creativity – and such creativity builds companies and creates patent portfolios. 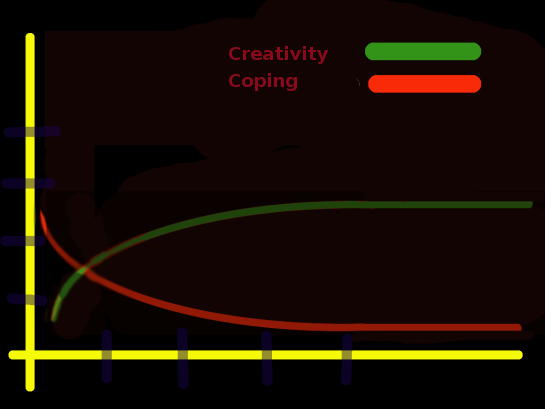 Another type of creativity – the creativity of the imagination – is more closely tied to the emotional state of a person. This probably makes for great romanticists and publishers of fictional novels, screen plays, and the opera. However – the emotional imagination – taken to an extreme level – equates with instability and irrationality, maybe even disorder, and could be accompanied by a certain level of incapacitation. So, that we might not see to be a very sensible aspiration. Engineers often refer to something known as a “crossover point.” It is very often an optimal place to be. Look at the graph at the top of the article. The crossover is where the two lines “cross over,” naturally enough. It’s quite intuitive that a cross over point presents the best of both attributes, and minimizes the deleterious effects of the extremes.